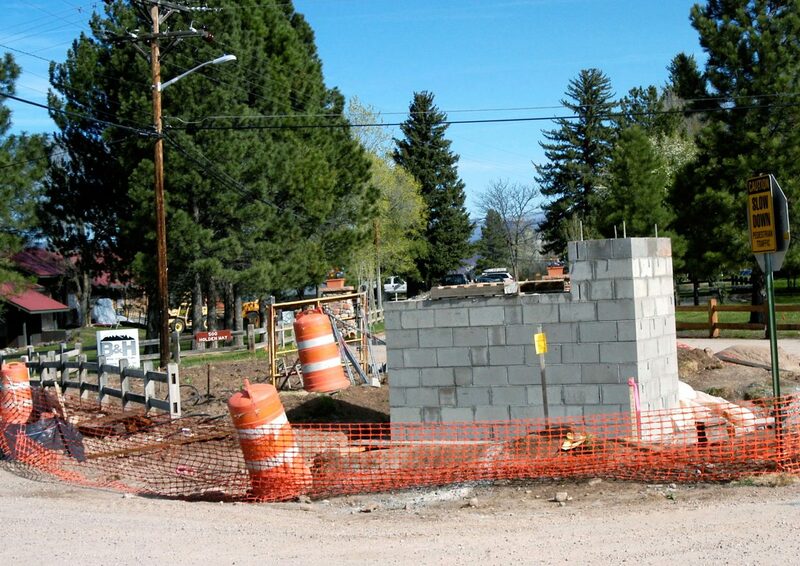 A dispute between Colorado Rocky Mountain School and neighbors over a new, landscaped entry to campus has led to a stop work order until Garfield County commissioners can review the situation. Neighbors are adamant that the new entry and stone monument will inhibit using a historic county right of way through the campus for nonmotorized passage, while the school says it is merely enhancing safety and following an agreement with the county. Concerns about maintaining public access through the CRMS campus were raised by some county officials last fall before the private school was granted a permit to realign its main entrance and build the entryway. County Planning Manager Tamra Allen, in a Nov. 10, 2014, email memo to Road and Bridge Director Deb Fiscus, pointed out that the driveway plan, while improving safety and vehicle access into the campus, also appeared to inhibit the public from using the historic county right of way that runs from County Road 106 on the south to Dolores Way on the north. Specifically, the landscaped berm and realigned entrance would force any pedestrians or bicycle riders to cross onto private school property, Allen noted. “This configuration might work if they were to leave sufficient space and surface for pedestrian/bicyclists to move through the area and stay within the ROW,” Allen wrote in the memo. “Or, they could dedicate a new alignment as ROW. “I suspect they won’t be excited about either of these options,” Allen surmised in the memo, which is included in a packet of information for county commissioners to consider today as they try to iron out the access dispute between the school and residents of the Satank neighborhood north of the campus. That dispute has boiled over in recent weeks, with neighbors crying foul that the school was continuing work on the entryway after county commissioners said at an April 6 meeting that they wanted to review the situation. School officials have maintained they were just doing what the county had approved, and that they have no intention of closing off public access. Some neighbors also recently took it upon themselves to replace an iron grate that had been used to cross an irrigation ditch on the north end of the campus with a culvert and earthen path. That work was done without approval from the Rockford Ditch Co., in which CRMS has a majority share, or from the county. School officials said the trail work has since allowed for illegal ATV and motorcycle activity into and through the campus. The county last week issued “stop work” orders for any work within the county right of way until the matter can be discussed at today’s meeting. The regular meeting of the Board of County Commissioners begins at 8 a.m. at the county administration building in downtown Glenwood Springs. The CRMS matter is listed under county manager’s update during the morning agenda. The current-day dispute dates back to the 1970s when the county, at the request of CRMS, closed to vehicle traffic what used to be the main road from Carbondale to Satank via CR 106. In exchange, CRMS granted the easement for what would become Dolores Way. But the county held onto the public easement through the campus. Just last year, the commissioners, on a 2-1 vote, denied a request by CRMS to vacate the road for what it said were campus security reasons, maintaining that it should remain open as a pedestrian and bike route. CRMS had offered to complete a new pedestrian path along Dolores Way to the new Highway 133 path in exchange, an option supported by Commissioner Tom Jankovsky. But Commissioners John Martin and Mike Samson sided with Satank residents and other members of the public who said the campus access should remain. Allen’s comments last fall were in response to a request for input from Fiscus, who was being asked by CRMS officials to fast-track the driveway permit. Records show that CRMS Director of Finance Joe White requested in a Nov. 7, 2014, letter to county Road and Bridge officials that the permit be expedited, and said that the driveway plans conformed with what had been discussed with county officials during the summer of 2013. “We have redesigned the driveway in a manner that we believe will enhance safety beyond the plan you had prepared last summer,” White indicated. A permit was approved and signed by Road and Bridge officials on Nov. 13, three days after Allen raised her concerns. The permit carried stipulations that the county approve the landscaping prior to the work being started, and that pedestrian and bicycle access not be impeded. After the stop-work order was issued on April 28, White pointed out that CRMS was never asked to halt construction on the entryway after the April 6 meeting in which Satank resident John Armstrong asked that the county delineate and post a specific trail through the campus to avoid confusion. The delay is likely to cost the school extra money to complete the work and has resulted in workers being idled, said White in a letter sent to Allen the same day as the stop-work order was issued. He also asked that the north end of the campus be posted with the stop work order to halt the neighbors’ trail work. White also reiterated that the whole situation remains under a “cloud of uncertainty” since the county denied the road vacation request. “We still feel strongly that no public route through the campus is in the best interest of the school or even the greater community,” he wrote.